Nothing brings more life to a model railroad layout than bits of animation scattered here and there throughout the landscape. Visitors may not notice the movement at first but will be drawn back to make sure their eyes aren't playing tricks on them! "Did that door just open?" "I could swear that I just saw one of those prairie dogs pop out of his hole!" These comments are heard over and over at the new garden railway exhibit at Pittsburgh's Phipps Conservatory. These two simple animations and others add a great deal of interest and realism to the layout. Shortly after the passenger train goes by a secluded farm house a creaking noise is heard as the outhouse door slowly opens. Visitors peer inside to see a cowboy sitting on his throne. Suddenly he sees that he has an audience and the door slams shut to with a resounding thud! At the opposite end of the layout a family of prairie dogs basks in the sun. An observant eye notes that some of them randomly pop out of their holes and then disappear again. What could cause such a thing to happen? Both of these animations are powered by readily available devices that many of us have used over the years in radio control airplanes, cars and boats. These vehicles are commonly controlled by servos, small geared motors that connect to ailerons, elevators, flaps and other steering mechanisms and throttles in radio control systems. Even though animation can be achieved using switch motors, solenoids and other methods I think you will find that servos provide the most repeatable, reliable, flexible, powerful and economical method of moving things on your layout. 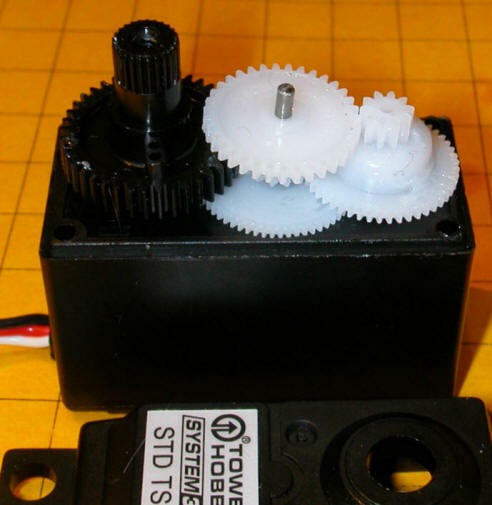 A servo contains a small motor and gear box that rotates a shaft to a precise location and holds it there. This photo shows a typical servo with its top removed. The position of the shaft is based on a digital signal. Most servos rotate through a 180 degree arc while delivering a good bit of torque. Three wires connect the servo to its controller. Two of the wires connect to a source of DC power, normally 5 to 6 volts. The other wire to the servo receives pulses from the controller that tell the servo where to position its shaft. In the photo below the red wire goes to the positive terminal of the power supply, the black wire goes to the negative and the white receives the positioning pulses. The control pulses are spaced 20 milliseconds apart and the length of each pulse determines where the servo's shaft will come to rest. A 1.5 millisecond pulse will place the shaft in its center position, sometimes referred to as "neutral". A shorter pulse of 1.25 ms will rotate the shaft 90 degrees to the right while a longer pulse of 1.75 ms will rotate the shaft 90 degrees to the left. In a model airplane radio control system these pulses are generated by the airplane's radio receiver. The length of the pulses is determined by the position of the radio control transmitter's joystick. This video shows a servo with a digital oscilloscope screen in the background. The square wave on the oscilloscope's screen gives a visual representation of the control pulses. Note that the square wave gets smaller as the servo rotates in a clockwise direction and elongates as the servo rotates counter clockwise. We could use radio control transmitters and receivers to control the servos that we use for animation in our layouts but there is a much simpler, more versatile and less expensive alternative. All we need is a device that can deliver an appropriate string of pulses to the servo. This can be done with any number of electronic circuits but the easiest to construct and utilize may be one utilizing the PICAXE microcontroller. I have written a number of articles that describe model railroad applications based on the PICAXE including a Robot Train, Morse Code Beacon, Flashing Ditch Lights and a Lighthouse Controller. I encourage you to read these articles for more information on the capabilities of this amazing chip. Please Note: For those of you who would like to experiment with servos and don't want to build your own circuitry or program the microcontroller I have put together a complete unit that is discussed later in this article. The PICAXE circuit that is used to experiment with servos couldn't be much simpler. Pins 1 and 8 of the PICAXE are connected to a 4.5 to 5.5 volt power supply. This can be three AA batteries wired in series or a regulated 5 volt supply. In the circuits we are using here I am using the same power supply for the controller and the servo. This works in most cases but some "noisy" servos cause interference and must have their own, separate source of power. Just make sure that the ground connection from both power sources are joined together. The third wire from the servo goes to pin 3 (also called out4 for output 4). This pin delivers the control pulses to the servo. The circuit above is shown in breadboard form below. The servo is to the left and its 3 pin connector is to the right. The 3 pin header between the PICAXE chip and the servo is for programming via the computer's serial port. The two horizontal rows of pins at the bottom are connected to the positive and negative terminals of a 4.5 volt battery pack. Take a moment to confirm that you can identity all of the connections shown in the schematic above as they are made in the photo below. The software is equally simple as the PICAXE 08M microcontroller has a built in command that can be used to position the servo. The command that we will use is appropriately named "SERVO". where "pin" is the pin that connects to the servo's white wire and "position" is a number between 40 and 210. 40 sets the servo at approximately 90 degrees left and 210 places it 90 degrees right. I say approximately because servo manufacturers differ a bit in the servo's range so some experimentation may be in order to set the shaft to an exact position. the "FOR-NEXT" loop in the next four lines step through the numbers between 40 and 210 storing the current number in variable "b0"
after a second 1 second pause the program start over "GOTO Start:"
The program can easily be modified to have the servo move to any position in its range by changing the numbers in the "FOR-NEXT" loop. The speed of movement of the servo is determined by the "PAUSE" command within the loop. The 100 ms pause means that a movement from 40 to 210 will take (210-40)*100 milliseconds or 17,000 milliseconds or 17 seconds. Changing the pause to 10 ms cuts the time to rotate from one extreme to the other to 1.7 seconds. For some applications setting the range of motion of the servo within the PICAXE software is the best way to go. There are other times, however, where it is convenient to be able to adjust the rotational limits without modifying the software with a computer. The prototype board below has the two potentiometers added to the right of the PICAXE. The pot on the left sets the counter clockwise starting position. The other pot sets the range of motion. This program uses Symbols to substitute more meaningful words for constants and variables. Thus memory locations W5 and W6 become Range and CCW. The use of symbols in programming the PICAXE is optional but it makes the program's logic clearer and the variables are easier to remember. Since we will be checking the pot settings twice I put the pot reading section at the bottom as a subroutine that is called by GOSUB GetPots. That command says go to the routine and do what is there. The RETURN command at the bottom of the routine returns to the line after the GOSUB and the program continues. READADC10 is a command that gets the position of the potentiometer and stores that value in a memory location, either Range or CW. The value returned is between 0 and 1023. We are using word variables (W5 & W6) for the pot readings. Normal PICAXE variables, B0 or B1 for example, are byte variables and can only store numbers between 0-255. The READADC10 command reads the pot and converts its analog value to a 10 bit number between 0 and 1023, thus a variable that can store a number larger than 255 is needed. The other commands in the "GetPots" subroutine, Range=Range/6 and CCW=CCW/6 + 30, scale the readings from the potentiometers and adjust them so that their rotation matches the rotation changes that are seen in the servo. After the potentiometer reading are completed the servo goes to its one extreme position, pauses for a time, 1.5 seconds in this case, then returns to its other position. To adjust the servo turn the potentiometer that is connected to pin in1, CCW in the program, all of the way towards the positive terminal. Turn the other potentiometer, called Range, all of the way towards its negative terminal. This sets the servo to start at its leftmost (most Counter Clock Wise) position and rotate to its maximum range. If the CCW pot is turned to the right the maximum CCW position is moved more to the right. Moving the Range pot to the left decreases how far the servo will move. Adjusting the two pots will give you complete control over the starting and ending point for the servo. The remaining input pin, Pin 4 (also called in3), is used for triggering the servo. It can be connected to any type of normally open SPST switch. For the Phipps layout I triggered the action in the outhouse with a reed switch that closes when a magnet glued to the bottom of the engine passes over it. The switch briefly connects Pin 4 (in3) to + 5 volts. When the switch is released resistor R4 immediately pulls the pin to ground. When a PICAXE pin "sees" + 5 volts it's value is "1". When it is connected to ground and "sees" 0 volts it's value is "0". You may remember that in programming the apostrophe makes the line a remark not a command that will be acted upon. Removing it activates the command. If Trigger = 0 the button is not pressed and the program goes back to the "start" location. When the button is pressed the value of "Trigger", which is just another name for "pin3" becomes a 1 and the program continues. Simple! You might think were are completely out of pins on the PICAXE but pin 7 (also called out0) can be asked to do double duty. Under most circumstances pin 7 is connected to the programming cable. It can be used as an output pin as well. The output device is this case is a digital sound card that can be triggered as the servo is activated. I have had very good luck using digital sound recorders from Electronics 123. The unit I use is A96010 which is available for less than $10.00. These and other sound boards are discussed in some detail in another article that deals with sound and model railroads. As you can see in the schematic below the sound recorder module only has a few connections. Power for the unit can be up to 6 volts so it works well with the 5 that we provide for the PICAXE board. Two wires are for a speaker or, in our system, an amplifier that gives much greater volume. The sound starts when a button is pressed or when the PICAXE activates the board through the button's connection. Since pin 7 (out0) is shared with the programming cable the sound recorder will be activated whenever a new program is loaded. The amplifier is likely to need more than 5 volts to give adequate volume. That is why 12 volts is specified on the schematic. If you hear a hum from the amplifier when the servo is running, as I did, put an electrolytic capacitor (I used 680 mfd / 16 volts) across the power leads to the servo. The only software change is the addition of code to toggle the state of pin Out0 so that the sound is started at the right time. In the example program below the sound is started as soon as the button is pressed. The changes are highlighted in bold type. Even though you might think that the placement of the LOW Audio command is critical as it could stop the sound prematurely, this is not an issue as the sound will start and continue playing to its end no matter when the audio pin's state is changed. Just make sure it is located somewhere in the program where it will be invoked before the sound clip is completed or the sound will start over again. Custom Circuit Board Simplifies Things! In order to make experimentation with servos simpler for me and others I designed a custom circuit board and had a few fabricated. The board is based on the schematic we have been using but has some features that will not be used at this time. Here are four photos of the unit from all angles. If you are interested in using one of these boards please drop me an email (dave@davebodnar.com ) to inquire about price and availability. The unused pins in the PICAXE socket are there because the board can also support the PICAXE 14M which has six additional pins. If you look carefully at the photo below you will see that the potentiometer closest to the edge of the board is labeled "Range". The board has a voltage regulator on it (lower right in the photo) so that DC power between 6 and 12 or more volts can be used to power the unit. If you are going to feed it with much more than 12 volts the regulator will get hot and a heat sink may be needed. The programming cable goes to the header in the bottom center. The other pot is clearly labeled "Start" in this photo. The servo connects to the three pin header at the lower right. Its black wire goes to the left onto the pin marked with a "-" symbol. The sound board connects to the pins labeled "Sound". You can also connect an LED, with appropriate current limiting resistor, to the "Sound" pins. The "Trigger" connects to a switch is located in the lower right. The 7805 voltage regulator is clearly visible in the upper left. So far the focus of our discussion has been on controlling the rotation of the servo's shaft. Next we have to look at how one can transfer this rotation to make our animation do something interesting. This short video shows the finished outhouse atop its base. The animation starts when a giant hand presses a small button! In the next video, taken at Phipps, the animation is activated twice. The first activation is because of the train going over the reed switch. The second time a magnet is manually moved across the reed switch. Can you tell it was windy the day this was filmed!!??!! The two photos below show an outhouse that is mounted on top of a plastic utility box that will be buried underneath the outhouse. The wires exiting the box are for an external speaker, trigger connection that goes to a reed switch on the track and a source of external power. The power wires come in from the bottom through holes that are left unsealed. This allows any water that might get in to escape from the bottom of the box. The mechanical connections are very straight forward. The door is opened and closed by a thin piece of piano wire that extends from the door down into the control box. The following set of photos will give you an idea of how it is constructed. The outhouse and servo are both mounted to the top of a plastic box. The servo is screwed to the piece of pine that is just behind it. Note the gasket on the bottom of the lid that helps to make the top of the box water tight. The wire that goes from the servo to the door is bent at both ends. One end goes onto the servo's horn, the other (seen at the right) moves the door. It is much easier to install the wire and pass it through the base if is cut into two pieces that can be reattached after installation. I didn't have a proper fitting to join the pieces back together so I soldered several model airplane wheel locks together. That gave me a sleeve with set screws to attach the pieces of wire together. 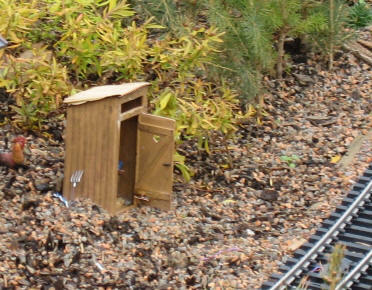 This close up view shows the model airplane hinges that are used to join the outhouse and the door. The rod that connects to the servo can be seen behind the top hinge. The hinges are inexpensive and make connecting doors a snap. Here the hinges are about half way into the door. When fully inserted and glued they are nearly invisible. The rod goes into a hole in the top door brace. When the servo rotates the rod the door opens and closes. The coupler makes removing the servo and/or outhouse a simple task. The piece of piano wire at the bottom is connected to the servo's horn with wire and is centered on the servo's shaft. Three bolts attach the amplifier that is seen below the servo. The amplifier was salvaged from an old set of computer speakers and fit in perfectly after a bit of trimming. The loose wires are from the original connections to the speakers and will be redone. The PICAXE circuit board, on the right, and the sound card, on the left, are mounted high and (hopefully) dry at the top of the unit. Notice that the board used here is not one of the custom boards shown above since this animation was made before the new boards were designed. The speaker is mounted externally behind a nearby shed. It is close enough to the outhouse and far enough from visitors so that the sound seems to be coming from the outhouse itself. Each member of the group of animated prairie dogs is operated by an individual servo. The parts that were used to make one prairie dog unit are shown below. The unit on the left is complete. It will be mounted under the lid of a box whose top is flush with the terrain on the layout so that only the small tube shows above ground. A carved and painted prairie dog is placed into the brass tube that is moved up and down by the servo. a spent 357 pistol cartridge that has its primer drilled out to 3/32" - the prairie dog fits into the large opening in the cartridge. a 3/32" diameter section of brass tubing flattened at one end and drilled with a 1/16 hole - it will be soldered into the primer hole in the cartridge. Here you can see how it is all assembled. When the servo rotates in a clockwise direction the cartridge goes up lifting the prairie dog that is attached to the cartridge above the ground. When it turns the other way the cartridge is pulled in lowering the prairie dog. This design, requiring a separate servo and controller for each animated animal, is the third, and most successful, of my experiments. The first used multiple cams, just like in an automobile's valve mechanism, to lift the prairie dogs. A motor turned the cam shaft and springs were used to return them into their holes. The second used a crankshaft, also found in automobile engines. Both designs were rejected for two reasons. First was the amount of power that was required to rotate the cam shaft under the stress of the springs. Even the crankshaft design, that used no springs, needed a powerful motor to keep things humming. The other, and more significant, drawback of both designs was that the prairie dogs always went up and down in the same sequence, just like a car's valves or pistons. There was no variety in movement. Prairie dog behavior dictates that all will be below ground at some time, especially if they are frightened. Neither of these systems provided for that. The servos took care of all of the problems as the sequence of movement wasn't tied to a single piece of hardware but to the computer program that ran the independent servos. Power was no longer an issue as each prairie dog has its own motor. If one failed or faltered the others would keep on working. In this video you can see the prairie dog motor and lift mechanism along with the square wave on the oscilloscope. Any number of animated animals can be controlled by separate PICAXE 08M chips or as many as six can be simultaneously controlled by another of the PICAXE chips that has more pins available. This video shows a single 18 pin controller operating six servos. The large capacitor, the blue cylindrical object, is needed to keep the system working under the strain of all of the motors being operated at once. A similar system is used with the prairie dogs at Phipps Conservatory. There, of course, the prairie dog's motion is random rather than this choreographed "dance"! 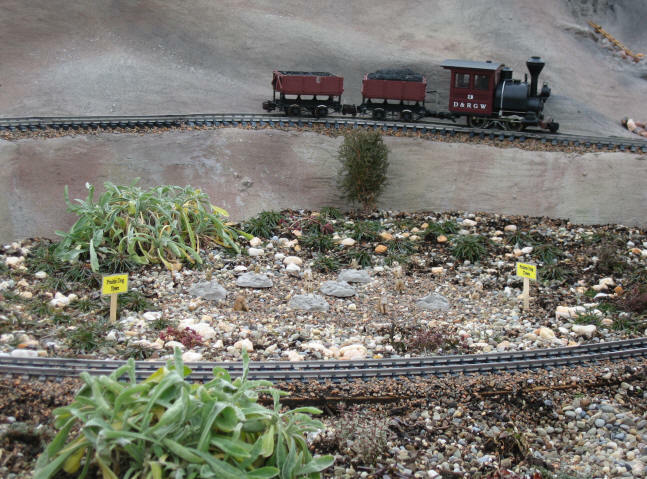 Here you can see the prairie dogs themselves moving up and down on the layout. You will have to look carefully as they are tiny little fellows and blend into the background! I have added spout movement to several Aristo Craft water towers. In each case the servo was mounted under the floor of the water barrel and a thin stainless steel rod was run to the spout. I made a mock up of such a water spout to show the flexibility and ease of adjustment of the two potentiometer servo circuit that we have been examining. It is shown in the video below. In the interest of time the speed of movement of the spout is fairly fast but could easily be slowed to a more prototypical speed by inserting a longer pause between each servo step in the software. Obviously you would not want to mount the servo below the spout as in this example but it is easily shifted to an out-of-the-way location. "How does such a simple device hold up to bad weather and continuous duty?" I am happy, and somewhat surprised, to be able to report that the prairie dogs and the outhouse have been operating daily at Phipps Conservatory since November 1, 2007. They have not shown any signs of failure nor have problems cropped up over a rather cold and wet Pittsburgh winter. I built backups for both animations in expectation of replacing one or both within a month or two but that has not yet been necessary. Hot summer weather may take its toll but so far, so good! Animating the water spout on a water tower as described above. A sensor next to the track detects when a train comes up to the tower and sits there for more than 20 seconds. Then the spout lowers to the sound of chains and running water. After an appropriate pause the spout returns to its upper position. Animating the bucket on a coal tipple. The operation is similar to that of the water spout. Lowering and raising crossing gate arms. When a train approaches the arms lower, lights flash and a bell sounds. After the last car passes the arms raise and the sound and lights stop. Animating semaphore signals. They can be precisely positioned with servos. Opening and closing garage doors, barn doors or doors on engine sheds / round houses. Animating people both on the layout (on a rocking chair, for example) and in or on railroad cars. There is no reason why the animation can't be on the train! How about tilting an ore car or opening & closing a box car door? Larger servos with more torque could be used to lift and adjust the boom on a crane. You can even remove the stops that limit servos travel and have them rotate continuously with the PICAXE board controlling speed and direction. I am sure that you have ideas, too! After all, the only limit to what you can do is your imagination! Please let me know your thoughts & ideas and if I can be of assistance.